The Belgian and British royal families, Germany's foreign minister and descendants of some of those who died in the WWI's battles gathered to mark the centenary of Passchendaele. 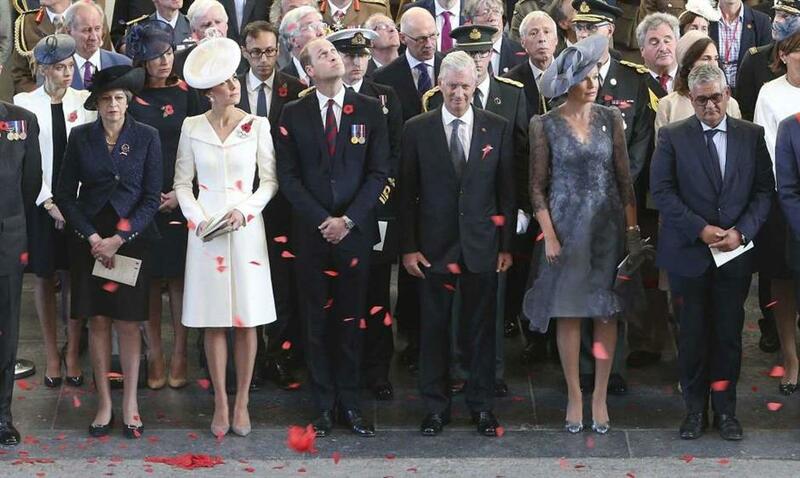 Britain's Prime Minister Theresa May, left, the Duchess and Duke of Cambridge, 3rd left, King Philippe, third right, and Queen Mathilde, second right, of Belgium, watch as the poppies fall from the roof of the Menin Gate in Ypres, Belgium for the official commemorations marking the 100th anniversary of the Battle of Passchendaele, also known as the Third Battle of Ypres, Sunday July 30, 2017. More than half a million Allied and German troops were killed or wounded in the World War I battle in western Belgium. The Belgian and British royal families, Germany's foreign minister and descendants of some of those who died in one of the First World War's bloodiest battles gathered Monday in western Belgium to mark the centenary of the assault known as Passchendaele. More than half a million Allied and German troops were killed or wounded in the Third Battle of Ypres, an assault that has come to be synonymous with the futility of war. The Allied campaign, fought by British and Commonwealth forces from July to November 1917 in the mud-slicked battlefields of Flanders, barely moved the front line against the Germans. Gathered at the Tyne Cot Cemetery, where almost 12,000 soldiers are buried, representatives from nations whose soldiers fought, and members of their families, paid homage to those who died. Britain's Prince Charles said the gathering was to honor their sacrifice and "to promise that we will never forget." When the battle started on July 31, 1917, World War I was entering its fourth year. Both sides were desperate for a breakthrough after suffering hundreds of thousands of casualties the year before at Verdun and the Somme in northern France, two other battles that vie with Passchendaele as the most costly of the war. German Foreign Minister Sigmar Gabriel said that "the battle of Flanders stands like Verdun for the senseless horror of war." "Diplomacy must never again fail as it did in 1914, there must never again be war in the middle of Europe, and never again must the youth of our continent be slaughtered," Gabriel said in a statement. He recalled that there has never before been a period in Europe of more than 70 years without war and destruction. "Today it is more true than ever in a world full of crises and conflicts that Europe is far more than a single market," Gabriel said. "Europe is a project of peace. Europe is our future. Only united can we succeed in protecting our interests and defending our values." Earlier, at dawn, around 100 people gathered at the Welsh memorial in Langemark, near where the battle began, as a cannon salute marked the start of commemorations. Welshman Peter Carter-Jones says the ceremony, and other commemorations held over the weekend, were "very moving." He said "all this has been done for those thousands of young men who died here so we can live in freedom. That is what it is about. It is for them, not for us."